NEW YORK, NY, July 18, 2018 – MCW (Miracle Corners of the World), a New York-based non-profit organization that aims to address communities’ pressing needs by empowering current leaders and readying leaders of tomorrow, celebrated its 14th annual gala last month at New York University’s Kimmel Center for University Life. The organization recognized the people and organizations who share its mission and sustain its programs through their leadership, support, and generosity. With more than 400 guests in attendance, the event raised more than $930,000 to support MCW’s Young Leaders, Community Development, and Oral Health Care programs in the United States, Africa, and around the world. Liz Claman, anchor at FOX Business Network, welcomed the gala’s attendees, and Ali Velshi, anchor at MSNBC and co-host of “MSNBC Live with Velshi & Ruhle,” served as the event’s Master of Ceremonies. The evening included updates on MCW’s programs and the work of MCW Young Leaders Program alumni, as well as a silent auction and special performance by Kitoko Groove Band, a Congolese musical group. Former New York City Mayor David Dinkins was among a host of distinguished guests from the diplomatic and business communities to attend the gala, including His Excellency Dr. Jakaya Kikwete, former President of the United Republic of Tanzania, who shared insights into the work MCW is doing in that country. 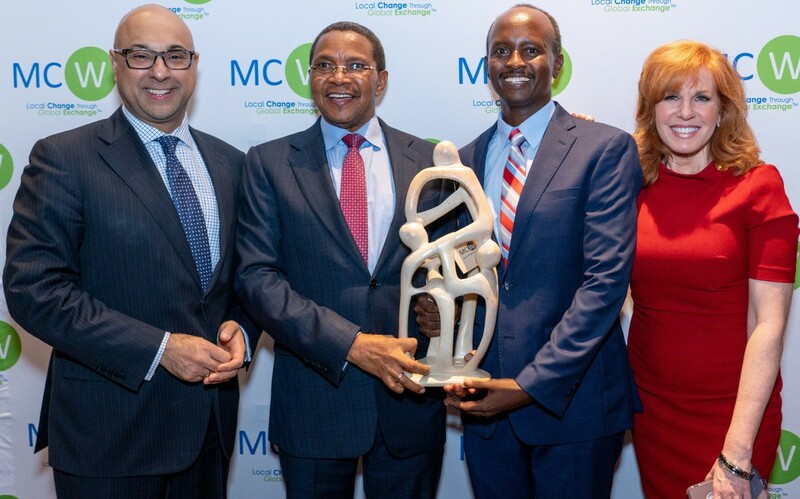 The MCW Leadership Award was presented to Leonard Chacha Kitoka, Managing Director and Founding Partner of INNOVEX, a Pan-African consulting firm dedicated to moving Africa forward through its professional services. Mr. Kitoka is also a Board Member of MC-Tanzania, MCW’s Tanzania-based branch. Mr. Kitoka was recognized for his longtime support and guidance of MCW’s Oral Health Care projects in Tanzania, and commitment to empowering youth and communities throughout the country. Mr. Kitoka’s award was presented by Dr. Marion Bergman, Director, Health Care Projects, MCW, and Regina Leichner, Director, Africa Programs, MCW. 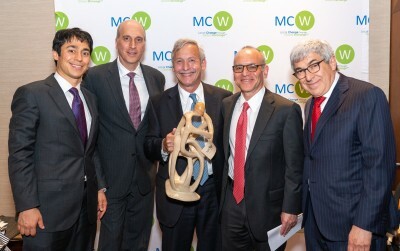 The MCW Community Partnership Award was presented to Proskauer Rose LLP, a New York-based international law firm. Proskauer Rose, which helped incorporate MCW in 1999, was recognized for its continuous support of the organization and its pro bono work on behalf of a range of clients, schools, and nonprofits. Steven Kirshenbaum, a member of the firm, accepted the award on Proskauer Rose’s behalf. The award was presented by a delegation from Henry Schein, Inc., led by Stanley M. Bergman, Chairman and CEO; Michael Ettinger, Senior Vice President, Corporate & Legal Affairs, and Chief of Staff; and Walter Siegel, Senior Vice President and General Counsel. The company is a longtime supporter of MCW through Henry Schein Cares, the company’s global corporate social responsibility program.